The Office of Greenways and Trails (OGT) has recently completed several new online itineraries or “road trips” for Sunshine State residents and visitors. Each road trip focuses on outdoor recreation, history and culture within a 15-mile radius of a chosen site. Each site is generally a small town, rural county or a state park that offers overnight accommoda-tions. The goal is to promote extended stays in by featuring multiple trail opportunities and points-of-interest. Locations range from Topsail Hill Preserve State Park in the Panhandle to White Springs in North-Central Florida to Lake Kissimmee State Park near Lake Wales. “We’re doing our part to promote sustainable tourism and to spread visitation throughout the state,” said OGT Bureau Chief Samantha Browne. Florida was a destination for 105 million tourists in 2015. By 2020, an estimated 125 million visitors are expected. Each road trip contains helpful maps and photos that can be found on the OGT website. When the overall project is complete, different themes that focus on Florida state parks will be explored. Seven road trips have already been completed for the “Wish You Were Here” project, one that features state parks that were once classic Old Florida attractions, such as Weeki Wachee Springs and Silver Springs. American Trails is seeking a host for its 2019 International Trails Symposium. The symposium is held every two years. The 2015 Symposium held in Portland, OR hosted more than 600 attendees, held numerous workshops and brought together planners from all over the world. The 2017 Symposium will be held May 7-10 in Dayton, OH. To obtain a host bid packet for the 2019 Symposium, contact Candace Mitchell at candace@americantrails.org. The deadline for bid proposals is Sept. 15, 2016. The Florida Greenways and Trails System (FGTS) is made up of existing, planned and conceptual trails and ecological greenways that form a connected, integrated statewide network. This green infrastructure plan ties together local trails to make regional and statewide connections, and links parks, preserves and other natural areas into greenways, forming a network to benefit the state’s natural and human environment. The plan uses locally adopted plans and community, agency and non-profit group recommendations to find where funds should be focused to improve the overall system. Trails that are part of the system include paved and unpaved hiking, biking, equestrian and shared-use paths, along with water trails. This year, OGT staff will begin the process of updating its five-year plan and priority trails map, both of which further the vision of establishing and expanding the FGTS. The map and plan update will begin with internal workshops and meetings with key partners, followed by an online and in-person public input campaign in 2017. The final draft of the 2018-2022 Plan and Priority Trails Map will be presented to the Florida Greenways and Trails Council for adoption at the end of 2017. Stay tuned for more information and a solicitation for input in the coming months and year. The priority trails map is increasingly important to statewide planning efforts, taking on special significance this past year when the Florida Department of Transportation’s Shared-Use Non-motorized (SUN) Trail Program used paved, shared-use trails on the map to create the SUN Trail Network. As the priority trails map is updated at the end of 2017, this information will be transmitted to partners including FDOT to update the SUN Trail Network and direct resources toward closing gaps in the system. The updated FGTS 2018-2022 map and plan is expected to serve as the baseline for future recommendations on funding by the Florida Greenways and Trails Council. Are you interested in hosting a public input workshop for this update process? If so, please contact the appropriate land trails or paddling coordinator. Whitney Sanford at Rocky Point along the Bartram Trail. One June 4, National Trails Days, the Bartram Trail in Putnam County was one of six local and state trails to receive the National Recreation Trails designation by the federal government. 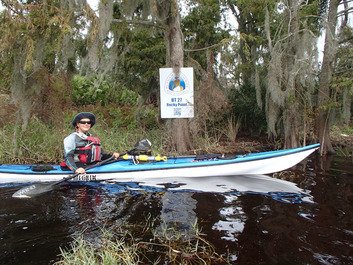 A $15,000 Florida Humanities grant helped to develop the trail and OGT's Paddling Coordinator, Liz Sparks, assisted trail organizers with the application process. The Bartram Trail in Putnam County was inspired by the writings of John Bartram and his son, William, naturalists and authors who explored the region in the 1700s. Many of the 30-plus sites that the two wrote about in Putnam County can now be visited by either land or water along the trail system. To celebrate the designation, a “Bartram Frolic” will be held Sept. 4-5 at the St. Johns River Center in Palatka. Festivities will include paddling trips, boat rides, music, a regatta and food the Bartrams described in their writings. The frolic commemorates the party William Bartram once celebrated with Native Americans at the site of present-day Palatka. The success of regional trails throughout the country can be accredited to building a brand with marketing, signs and promotions. This is apparent on trails such as the East Coast Greenway and Great Allegheny Passage Trail. This need now extends to the Florida Coast-to-Coast Trail (C2C), the cross Florida 250-mile trail that is being built from St. Petersburg along the Gulf Coast to the Atlantic Ocean near Titusville. As a result of a new planning study coordinated by several regional planning councils, the C2C Trail Leadership Team recommended the adoption of several types of signs and logos that can be used for wayfinding and branding trails at their June 3 meeting in Clermont. The research team also recommended removing “Connector” from the name, coining the new name for the trail as the Florida Coast-to-Coast Trail, which identifies the connection between Florida’s two coastlines and addresses the trail’s non-auto focus. The leadership team will now work with municipalities and counties to put in place wayfinding, monument and other signs. The new C2C logo could be placed on existing trail signs or retrofitted to the C2C style. Trail segments will be constructed and opened relatively quickly as a newly dedicated source of funding was recently established, and each gap closed represents growth in the statewide system. Signs will be installed where feasible to assist in wayfinding. For further information, please e-mail Brian.Ruscher@dep.state.fl.us or call 850-245-2078. 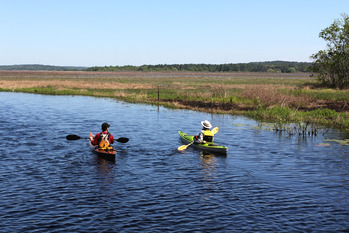 Located just north of Tallahassee, Lake Jackson is Florida’s newest designated paddling trail. More than 4,000 acres in size, the expansive lake provides a tranquil oasis within a bustling urban area and is an enticing destination for viewing sunsets, paddling, boating, fishing and birding. With wide open vistas and a variety of rich wetland habitats, Lake Jackson offers excellent birding opportunities as several small parks surrounding the lake are sites featured on the Great Florida Birding and Wildlife Trail. Lake Jackson has historically been a prime destination for bass fishing and other freshwater fish, while hunters are drawn here during the short winter waterfowl hunting season. Paddling on Lake Jackson is relatively easy given its openness, lack of current and few powerboats. Access to the lake is convenient with multiple county boat landings, which allow visitors to create a trip of any length. Lake Jackson is considered to be a “prairie lake” because it occasionally drains due to several sinkholes located in the lake bed. The lake’s most recent dry event occurred in 2007, but water levels have since risen to make for ideal paddling.